KCKCC developing ‘Giving Grove’ on main campus – Welcome to Wyandotte Daily! If you have been walking on the Kansas City Kansas Community College in the last few weeks, you might have noticed a new grove of trees between the Jewell Student Center and the Flint Building. This is KCKCC’s Giving Grove. 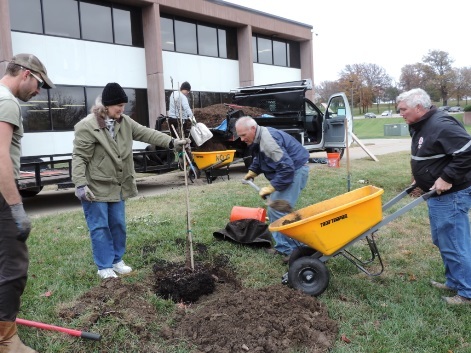 Penny Mahon, media and reference librarian at KCKCC and the chair of the college’s Sustainable Environments Committee, said after the committee learned about the purpose of a Giving Grove, they decided it was an important enough endeavor to bring to the college. Planted last fall, there are 13 trees in KCKCC’s Giving Grove. Choices were made based on hardiness, reliability, productivity, disease-resistance, and, of course, ability to thrive in the Greater Kansas City area. The grove includes four semi-dwarf apple, three Asian Pear, three Euro Pear and three Bush Cherry trees. A program of the Kansas City Community Gardens, the Giving Grove provides educational assistance to community groups, children and low-income individuals throughout the Kansas City area in order to give them the skills to grow and produce their own food. The idea is to create edible tree gardens in the community and to work together to plant, grow, tend, harvest and share fresh produce. For more information about the program, visit www.givinggrove.org. In the annual county health rankings report, Wyandotte County ranks near the bottom or very last in the state of Kansas. In addition, Wyandotte County has a food insecurity rate of 18 percent compared to the Kansas average of 16.5 percent. Food insecurity happens when people have limited or uncertain access to adequate food. Giving Groves such as the one at KCKCC help to alleviate some of that food insecurity and help community members live a healthier lifestyle. 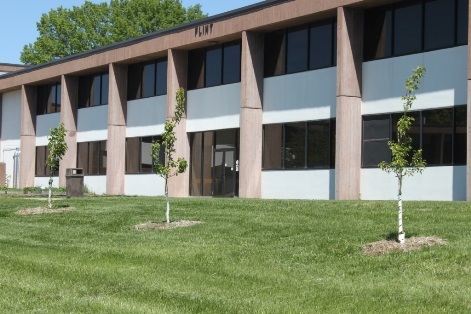 Mahon said KCKCC’s Giving Grove has two stewards – herself and KCKCC science professor Curtis Smith, who are in charge of overseeing the grove from watering and pruning to fertilization as needed. Stewards must attend multiple training sessions with Kansas City Community Gardens before being qualified to maintain the grove. Buildings and Grounds have also assisted in watering the grove as well as the planting of the trees.